A vehicle was reported stolen during the burglary, which happened just after 1.30am today, and was seen a few minutes later on Kingsfold Drive by officers called to the area. The car was boxed in and the men were arrested just after 1.30am today by the Lancashire police tactical operations team, special operations and police dog Sirius and his handler. One of them required medical treatment. 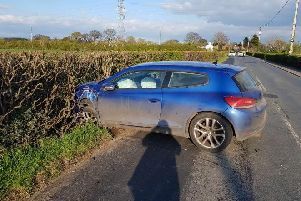 A Preston police spokesman said: "At just after 01:30 a vehicle was taken in the course of a burglary in Penwortham and spotted a few minutes later by officers who had made to the area. Team 1 TACOPS officers have pursued the vehicle and successfully detained three males in the car, bringing the pursuit to a safe conclusion. "All suspects now accommodated in our cells for the night with one getting some treatment having become a little too acquainted with PD Sirius."